Enjoy being surrounded by warm, sandy beaches with a Mariott Vacation Club's Kauai Lagoons timeshare! This beautiful oasis is the perfect Hawaiian getaway for a couple or family. Celebrate a special occasion, make a new memory, or just take time out to relax with this gorgeous tropical resort. Buying one of Marriott's Kauai Lagoons timeshares will introduce you to a new way of life as you stroll the soft beaches and soak up the increadible Hawaiian rays. Find Hawaii timeshare deals here and you'll be on your way to owning a piece of paradise. Kauai is Hawaii's fourth largest island and one of the most lush. This oasis is often called the "Garden Isle" due to the sheer number of tropical rainforest-like areas around the island. In addition to Kauai's sheer beauty, the setting is also perfect for exciting activities such as zip lining and canoeing. Nearby attractions to the resort include Fern Grotto, Opaeka'a Falls, Huleia National Wildlife Refuge, Menehune Fish Pond, Spouting Horn Park, and Waimea Canyon. The average temperature throughout the year in Kauai ranges from 75 degrees to 85 degrees fahrenheit, making it the perfect time to visit Marriott's Kauai Lagoons timeshare year 'round. Near your Kauai timeshare resale, you'll find many outdoor adventure tours, golf courses, horseback trails, and other attractions for you and the whole family to enjoy. Marriott's Kauai Lagoons features a stunning secluded beach setting. This gorgeous resort is part of a 500 acre master planned community designed for peace and tranquility amongst the lush Hawaiian landscape. 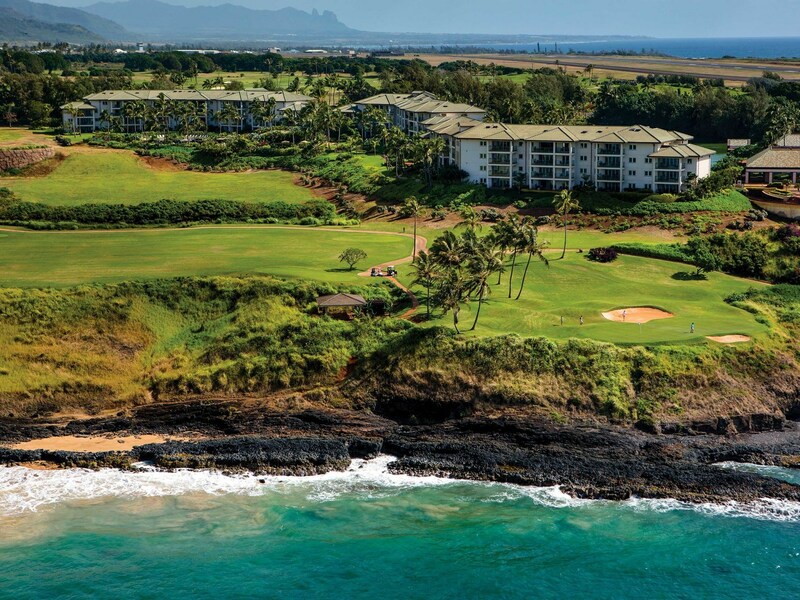 Marriott's Kauai Lagoons is home to the Kauai Lagoons Golf Club, a Jack Nicklaus 18-hole signature course. The on-site Kalanipu’u Fitness Center also allows visitors to enjoy their workout while overlooking spectacular ocean views. Guests may also enjoy a heated outdoor on-site pool and spa. Mariott's Kauai Lagoons offers two- and three-bedroom villa timeshares for sale. Each room includes a modern design and Hawaiian-inspired furnishings. A separate living room with pull out bed and bedroom spaces allow for up to 10 guests to stay comfortably. In addition, Marriott's timeshare villas also feature an in-unit utility room and gourmet kitchen. The kitchen is fully equipped and includes stainless steel appliances and granite counter tops. This is the perfect place for an extended family vacation! Are you ready to buy a Marriott Vacation Club's Kauai Lagoons timeshare? Why not purchase a previously owned share, called a resale, for much less than full retail price offered directly by Marriott? The experienced agents at Premier Timeshare Resale can help get you started! With Premier Timeshare Resale, it is easy to sell or buy a timeshare. Marriott timeshares are an investments that will last a lifetime, so find the perfect timeshare deals for you today!